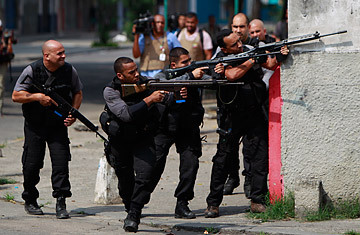 Policemen aim their weapons as they take cover from shooting during an operation against drug traffickers at the Vila Cruzeiro slum in Rio de Janeiro on Thursday, Nov. 25, 2010. Police entered the heavily fortified slum in an effort to apprehend drug-gang leaders they blame for widespread violence in the city. Rio de Janeiro is almost as savage as it is beautiful. So after it was awarded the 2016 Olympic Games, city officials took action to make the self-proclaimed "Marvelous City" a safer place. Authorities ramped up an already growing program that used "softly, softly" tactics to bring community police stations into the favelas where drug gangs held sway. The traffickers went quietly at first, but if authorities thought the vicious and powerfully armed factions were beaten, they got a rude awakening this week. Rival drug gangs fought back, uniting for the first time in years to take on the police and terrorize a city that has seen more than its share of bloodshed. After five days of bus burnings, shootings, attacks and counterattacks, at least 39 people were dead, including some civilians caught in the cross fire. The trouble flared on Sunday, Nov. 21, after drug gangs angry at the prospect of losing their territory fired on police stations and torched buses and cars. Such choreographed waves of attacks are not uncommon in Rio, but police usually seek to contain the trouble  and keep it far from the big tourist districts of Copacabana, Sugar Loaf and Christ the Redeemer  rather than counterattack. But this time, the reaction was different. "What we have are terrorist acts clearly [designed] to corner authorities and create a climate of 'This policy isn't working, because we can do what we want,' " said Rio Mayor Eduardo Pães. "We are not asking for a truce with terrorists, criminals, delinquents. This time we are not going to back down." Putting muscle and firepower into Pãaes' words, the Rio police borrowed massive armored vehicles from the navy that enabled the cops to enter the heavily built-up favelas with a measure of protection. The traffickers retreated en masse up hills and along dirt paths into neighboring shanties. Vivid footage shot from TV helicopters showed bandits, their automatic weapons slung over their backs, fleeing on foot, on motorbike and crammed into the backs of pickups. Some appeared to be downed by police fire. "We have taken from these people what was never taken from them before  their territory," said Jose Mariano Beltrame, Rio state's security chief, using unusually warlike language. "They commit their barbarous acts, and they run for their hideouts, protected by weapons of war. It's important to arrest them, but it is more important to occupy their territory. Without seizing territory, there is no advance." But when Pães took over as mayor two years ago, something changed. The crusading young technocrat halted the torpor with a campaign that, like the "broken windows" strategy of former New York City mayor Rudy Giuliani, went after even the pettiest of offenders. Buoyed by record investment ahead of the 2016 Olympics and 2014 World Cup (whose final will be held in the city's legendary Maracanã stadium) and aided by a new climate of cooperation between municipal, state and federal leaders, Pães gave locals a sense that authorities were making serious efforts to tackle the city's problems for the first time in years. Central to that was the Pacifier Police Divisions (UPP), squadrons of officers who have occupied favelas with community-policing methods pioneered in U.S. cities like New York and Boston. Unlike in the past, when officers stormed into and out of favelas with guns blazing, this time UPP officers entered quietly and stayed. The strategy has so far been implemented in only 15 of Rio's 1,000 or so favelas, but it has been successful, and there are plans to expand it as time goes on. That is bad news for drug gangs, who have felt the squeeze on them and their profits. Three gangs control the lucrative trades of marijuana and cocaine, and their turf wars are the source of much of the city's violence. One of the most notable aspects of this week's trouble  and a sure sign that they are taking the UPP threat seriously  is that the gangs have united forces for the first time since they splintered in the mid-1990s. Now those gangs are quite literally on the run. Rio's future depends largely on how they regroup and react. This week's battles could mark the beginning of the end  or a new phase in a longer and bloodier war.